From classic turkey casseroles and soups to amazing turkey and mashed potato croquettes, you're sure to find creative ideas and recipes in this list to help use up those Thanksgiving leftovers. If you happen to go away for Thanksgiving, you might be tempted to roast a turkey or turkey breast when you get home just for the leftovers! 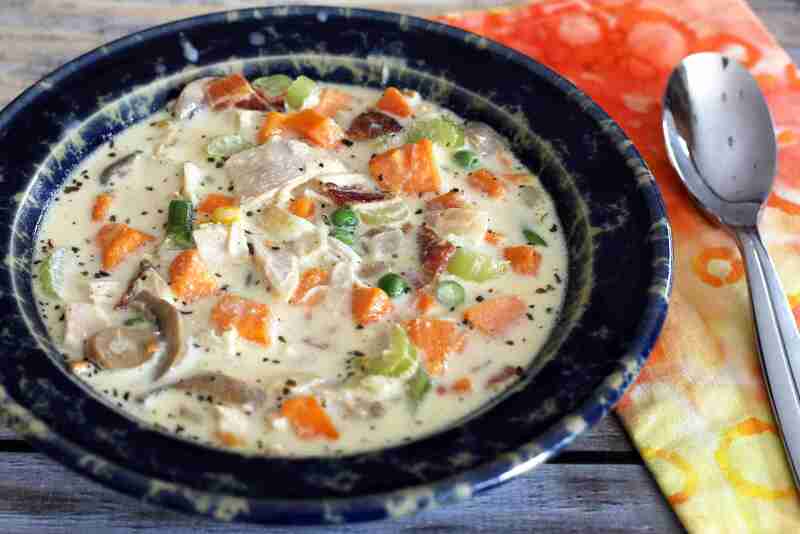 Leftover turkey teams up with sweet potatoes, a variety of mixed vegetables, bacon and optional mushrooms in this delicious and attractive soup. The recipe calls for half-and-half, but feel free to lighten it up with whole milk. Swiss cheese and a some diced ham flavor this turkey and pasta casserole. Leftover croissant crumbs make a tasty topping for this dish. Here's a genius idea for using leftover Thanksgiving fixings - make pizza! The stunning pizza turns the leftover turkey and mashed potatoes into toppings for this homemade pizza. Bacon, cheese and scallions finish it nicely. Make these turkey croquettes for a post-holiday meal or make smaller ones and serve them as appetizers. Whichever option you choose, it's sure to be delicious! The croquettes are shaped and frozen, finished with a bread coating and fried to perfection. Serve them with leftover or store-bought gravy and cranberry sauce. Use mini penne pasta, elbows or small shells in this cheesy turkey, pasta and asparagus casserole. Make this fabulous turkey and dumplings with chicken if you don't have turkey. It's a Southern-style dish made with homemade buttermilk dumplings. Crepes are another excellent way to jazz up leftover turkey. The crepes are elegant enough for a special dinner and easy enough for an everyday family meal. Serve the crepes with steamed broccoli or asparagus spears and a salad. Add a rice dish for a heartier meal. This turkey and biscuit bake is a great way to enjoy that leftover turkey, and it can be made with chicken as well. Add some chopped fresh parsley to the homemade biscuits for an extra-special look. Cut the prep time in half with purchased frozen biscuits or a can of refrigerated biscuits. Leftover cooked turkey is diced and simmered with a nicely seasoned combination of curry powder, ginger, chicken stock and pineapple. We suggest serving this turkey curry with rice. Yum! This incredible quiche is full of fresh broccoli, chopped cooked turkey and shredded Gruyere (or Swiss) cheese. A dash of curry powder adds a nice flavor to the filling. Turn your holiday dinner leftovers into a tasty burrito. Heat your leftover turkey, mashed potatoes and stuffing, and wrap them up in a warm tortilla. Hot leftover gravy and some shredded cheese make up the topping for the burrito. Make one or make several! Red poblano peppers and pepper jack cheese give this turkey quiche a burst of color and some heat. Or make it with sweet red bell peppers and mild cheddar cheese. It's an excellent brunch, lunch, or dinner dish. Here's another classic way to use leftover turkey and vegetables. Condensed cream of mushroom soup and seasonings make this turkey a la king an easy and convenient dish to put together on a busy day. Use pita bread, flatbread or naan in this innovative sandwich. The cranberry pomegranate sauce, shredded cooked turkey (or chicken), and leftover stuffing make up the savory topping. Thanksgiving turkey and some leftover vegetables are used to stuff these yummy empanadas. Serve these little turkey pies with cranberry sauce. Grapes and a lemony mayonnaise dressing flavor this turkey salad perfectly. Optional chopped pecans add texture to the dish. Toast the pecans for extra flavor. These egg rolls are another exciting way to repurpose the holiday leftovers. Serve the egg rolls with tangy sweet and sour cranberry sauce. And they are freezer-friendly! This easy casserole is made with homemade white sauce, cheese, broccoli, cooked turkey and some grated Parmesan cheese. The dish is briefly broiled to brown the cheese topping. This turkey pot pie recipe includes a homemade pastry. Feel free to use a sheet of prepared pie pastry if you're short on time. This macaroni and cheese casserole makes good use of that leftover turkey. A simple sauce brings the ingredients together while the toasted almond topping adds texture. Replace the toasted almonds with buttered breadcrumbs if you'd like. Turkey tetrazzini is a classic casserole typically made with cooked leftover turkey. Don't wait for a holiday dinner to make this tasty dish. Use leftover Parker house rolls or a flat of pull-apart dinner rolls (e.g., Kings Hawaiian) to make these tasty turkey and cheese appetizer sandwiches. This is a basic turkey salad. Delicious when served in either your favorite sandwich rolls or bread, a lettuce wrap or in tortilla wraps. Add fries, chips or a cup of soup for a tasty lunch or supper. This tasty turkey and stuffing casserole is always a hit. It makes use of leftover turkey, dressing and gravy. Top the casserole with cranberry sauce or serve it on the side. These tasty turkey enchiladas make good use of leftover turkey. Cheese, sour cream and tortillas are among the ingredients. Serve turkey enchiladas with Mexican rice or a tossed salad. Are you watching your carbs? These amazing turkey salad lettuce wraps will help get you back on your lower carb regimen after that holiday feast. The topping is a homemade cranberry and maple mustard. Delectable! Serve this creamed turkey on toast points, biscuits, puff pastry shells or over hot cooked rice.